Since I knew nothing about Shanghai, I decided to take a day tour around the city and see the sights. Though I believe in wandering about on your own, and I advocate discovery through exploration, I am not against taking a tour. Tours are wonderful tools for a traveler. I only had one full day in Shanghai, and I wanted to see as much as I could. In a limited time frame a tour can get you to most things mentioned in a guide book. If you are very much out of your element, then a tour can get you to places which are hard to locate. Tours are great because they’re a fast introduction to a new place. A tour can be a better way to travel, economically. Usually, the admission to local attractions is already paid for, as is a meal. And depending on the size of the tour, the travel itself can be more comfortable than public transportation. You feel safe on a tour – you have no responsibilities other than to go where told. Tours are great for relaxing. You become a target for every pickpocket, tout, and vendor in your immediate area. If you go on a tour, be prepared to feel like you have a giant neon arrow which reads “EASY TARGET” sitting above your head. You have to listen to a tour guide – a good tour guide knows its ok to be quiet sometimes. A nervous tour guide will repeat themselves ad naseum. There is no escape from a bad tour guide, and a bad tour guide can ruin even the best of locations. Many tours have pre-planned shopping stops. These stores are full of really smiling, helpful people who notice that you have a giant arrow over your head, and think that by applying constant pressure you will simply hand over all your money. The prices are usually higher too. You will be treated like a toddler. A wealthy, gullible, toddler. You might not be rich, and you might be the most savvy of savants, but neither of these things matter when on a tour. You are, for all intents and purposes, a herd animal. My Shanghai day tour was me in a van. I was the only one from my hotel going on the tour. We picked up a second gentleman from Australia, along with our guide, from a second hotel. And that was it – two people and a guide. I’ve never been on such a small tour before. We drove around the city, keeping to a relaxed schedule. Our guide was decent, though she did not understand most of my questions. I asked her about telling the difference between statues of lions and statues of dogs, and she kept insisting that they don’t eat dogs in Shanghai. I think that’s what she was insisting – either that, or that Chinese people don’t make statues of dogs, which I know is not true because I’ve seen them. I never did find out. I learned that most of the buildings in Shanghai are not old at all – through wars and foreign involvement most of the city is relatively new. Much of the history seemed to come from the early 20th century. 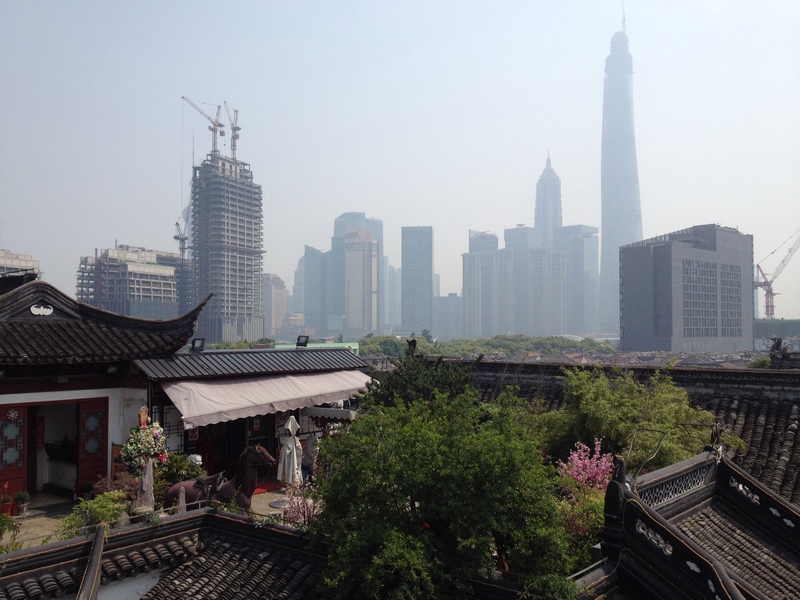 From the top of Yu (Yuan) Gardens, one can see the skyline rising ever higher in the distance. It really illustrates the different influences pulling at the city. I learned that “yuan” means “garden.” So saying “Yu yuan gardens” is actually redundant. I think they let us say it so we can use our word, but hearing “yu yuan” will let a taxi know where to go regardless. Lunch was like a blind date almost, since our guide left to get her own lunch and so it was just the Australian businessman and myself. We chatted about the probable collapse of the Chinese system due to environmental neglect. It was interesting – he’s the second independent source to suggest that this place cannot last. Because there were only two of us, my guide offered to drop me off at the Shanghai International Bookstore, rather than drive me back to the hotel. She said it was a straight walk to the Bund to see the skyline at night, and that if I wanted there was shopping about five minutes in the opposite direction as well. I putzed around, waiting for the sun to set. The bookstore was nice, though I could not carry any back to Chengdu with me. Shanghai prides itself on its shopping – malls are everywhere, seven and eight stories high, containing every brand imaginable. I’m not much of shopper, especially when I’m traveling. I save money for souvenirs and local treats, not another pair of shoes. And here I shall admit something else – Shanghai was not on my China bucket list. For me, it’s a commercial city with a tacky skyline. I went because a family member was actually doing business in Shanghai, and I thought it would be cool to play jetsetter and meet said family member. At 7pm, the lights on the Bund turn on, synchronized to the bell tower (an anachronism itself). I sat slightly chilled on the boardwalk, looking at the mass of steel and glass and concrete across the river. I fought the urge to tap my foot – I mean, just turn on already! Why am I waiting out here for hours just to see some neon lights? The main part of the Shanghai skyline. I did not think it would be worth sitting out in the chill to observe, but I was incorrect. 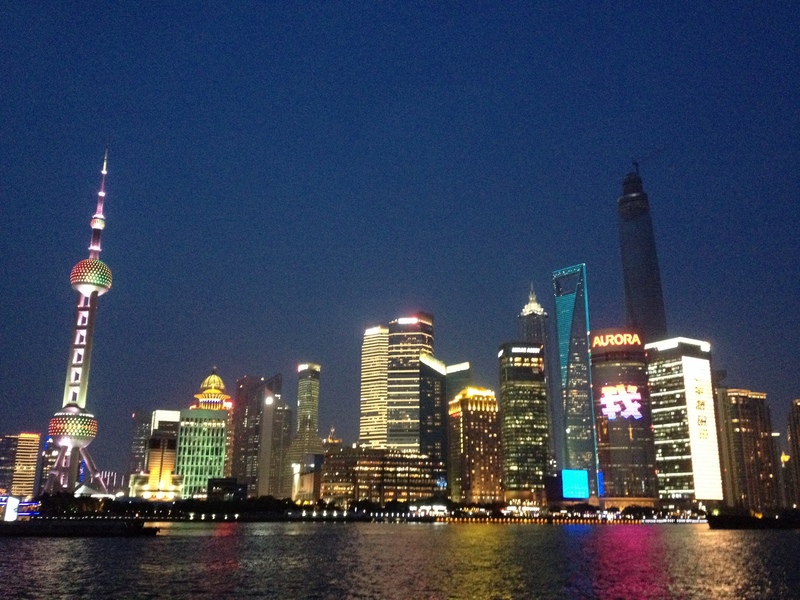 A panorama of the skyline, and some of The Bund where I was standing. This Post was posted in Places, Travel and tagged China, China Travel, Chinese tourism, Neon lights, Shanghai, skylines, the Bund, Tour Groups, Tourism, travel abroad, Yu Yuan Gardens. Bookmark the permalink.